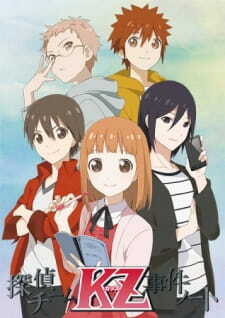 Tantei Team KZ Jiken Note is a series about a group of middle schoolers who solve mysteries in their spare time...That's all I've got for an introduction. Firstly, credit where it's due. In an era of anime where every other show seems to be about high school kids with magic-science-demon powers saving the world, it's refreshing to find a story where the stakes seem appropriate to the setting. Tales of earth shattering events, evil conspiracies & alien invasions so often found in anime can sometimes feel like a lazy way for the writer to up the stakes in a story that they are otherwise unable to come up with ways to keep the readers attention. KZ meanwhile has thus far kept its mysteries grounded in the reality of a typical middle schooler. That's not to say the mysteries are so trivial as to be pointless, or that the story fails to raise the stakes as things progress towards a solution. Nor do I suspect that many of the viewers have found themselves in some or any of the situations that arise. But what I mean by grounded in reality is that you can imagine, for example, a group of fifteen year old's trying to find out why one of their friends got food poisoning & following that trail to a local factory selling tainted meat. Not everything has to be about saving the world, stopping murderers or finding your one true love to be engaging. In some ways it has the charms of reading Enid Blyton or Richmal Crompton stories (do kids still read those?) about school kids trying to solve the mysteries of missing shoes or just trying to find things to do on a boring family holiday. Frankly it's rather refreshing to watch something like KZ, given that 2015 was full of magic power fantasies & overly dramatic love stories to the point that it got quite tiring. Unfortunately, KZ is not without problems, & quite major ones at that. As is too often the case with ensemble casts, the characters are quite limited in their personalities. Each of the four male members of the KZ team suffer from the usual anime problem of having one (& precisely one!) character trait that has to match with their art design. Nothing happens with any of them, either in terms of their personalities or how their relationships develop (or don't) that you wouldn't have been able to predict just by looking at the MAL image. The shows production is a mixed bag. On the one hand, the water colour look of the background art & the softer pastel colours & borderlines of the characters give the show a nice, relaxed look. But like a frustrating number of slice of life type shows in recent years, KZ suffers from what appears to be the current image editing logic that brighter = better. The result is that the screen is often so bright that it overwhelms the image, washing out any subtler or softer tones &, for instance, giving faces a ghostly, colourless appearance. Indeed at times, usually when there is a lot of white space on the screen, it can get quite uncomfortable to watch. But perhaps the biggest problem with KZ is that the writing is what some would describe as fanficcy. This term is often used derogatively & unfairly, but it's the best way I could sum up what watching KZ can seem like. Indeed, if you told me that KZ started out as a fanfic of Secret Seven or another kids mystery book into which the author wrote themselves, I'd believe you. Her "skill" that she brings to the group, that being her superior language skills, has mattered precisely zero times so far & indeed really just means she's a bit better at Japanese (I presume referring to memorising more Kanji?) than the others. None the less, those boys sure do want to impress upon her the importance of that skill & they just have to get to know her better or confide with her about things that they can't even tell each other, despite being friends far longer. Really that's her skill, the power to make the hottest boys in school want to talk to her & to see through to the real them. No surprises that, for instance, when everyone's telling her not to hang out with the green haired delinquent (who takes an interest in her, naturally), she'll stubbornly insist that he's just misunderstood & wouldn't you know it she get's through his tough exterior & is proved right. Indeed, while nominally a show about solving mysteries, KZ wears all the trappings of a harem. Each episode will make sure to find time for her & one of the boys (each mystery tends to have a b-plot revolving around one of them) to have one or more of those "moments" where they have an emotional connection that in no way impacts the story or their relationship going forward. I will say that the shorter run time of KZ helps ensure that these don't end up as excruciatingly drawn out as they often are in shows with a standard episode length, but they're still clearly there just to make the tweenage girl in you go "sqwee!" That's the thing about KZ, though: it's clearly meant for an audience of younger girls. While I stand by my criticisms, I'm also aware that since I'm neither of those things, it's not unreasonable to respond with "well it wasn't made for you, so why are you watching it?" Whether its target audience would have the same complaints I do or not, I couldn't say. But it is something to bear in mind when watching KZ. As a mystery series aimed at a younger audience, KZ does a decent job of keeping things grounded yet still interesting, but does have the usual problems with leaps of logic & the occasional convenient convergence of events to wrap everything up. Someone also needs to explain to Kazuomi that blackmailing a criminal is still a crime. But it's not really possible to not view KZ as, at least on some level, a harem; one that seems less about using Aya as a way to connect the audience with a variety of interesting males than it is about making her seem like the kind of girl that the guys just can't help but be drawn to. Sounds like the protagonist of your typical fantasy light novel, now that I think about it. Anime aimed for kids are often completely ignored by the English speaking community, but sometimes they can be pretty worthwhile. One of the more recently overlooked ones is Tantei Team Jiken Note. What this series does really well is to show the sense of isolation our main character feels. Tachibana Aya is a young girl who finds it difficult to make friends, a universal problem especially common in children. It portrays her thought process very accurately, with evidence shown by her personality and family situation. Because of how well these points are established, we care more when she finally gets the company she longed for, creating a real sense of attachment to the characters in the series. However, the mysteries in the show aren't great. The way each of them is solved is absurd, with middle schoolers having access to information most adults can't even hope to obtain. The series is smart though for keeping other better aspects of it in the spotlight while the mysteries are going on, character development and motivations are fleshed out during the solving of a mystery which help keep the series relatively entertaining. I was surprised when the series ended, it was pretty abrupt and inconclusive. But despite these caveats, I think it was a really nice series to watch, not many anime manage to deal with its core themes as well as Tantei Team Jiken Note.